Another short-lived 70s genre show that garnered a hardcover UK "Annual" was Man From Atlantis, starring Patrick Duffy as the titular undersea adventurer. 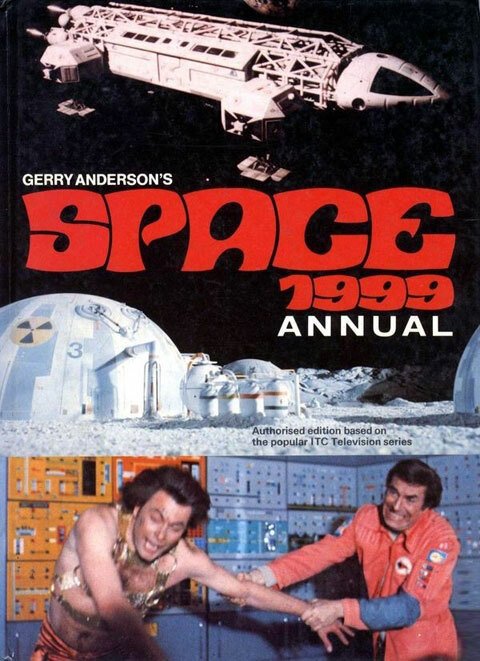 As with the Space: 1999 Annuals that I recently covered here on the site, I've never actually seen this book in person, but I presume that its contents were the usual mix of comic book-type stories and short articles about the cast and characters. 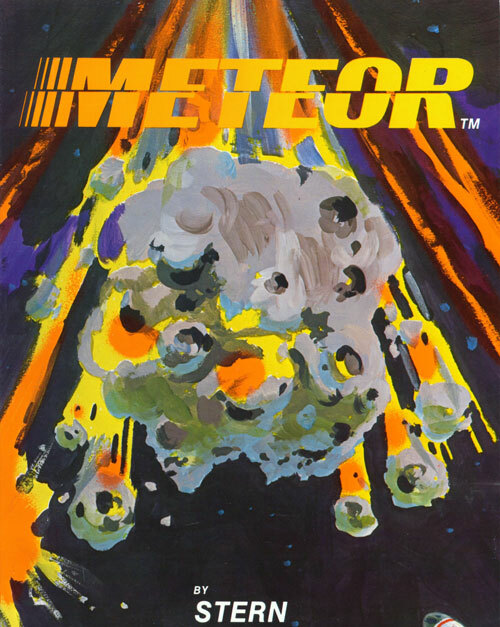 I'm guessing from the logo and the game graphics that this Sega video game (in which the big boss is apparently the space probe Nomad from "The Changeling!") came out as a tie-in with Star Trek II: The Wrath Of Khan in 1982. 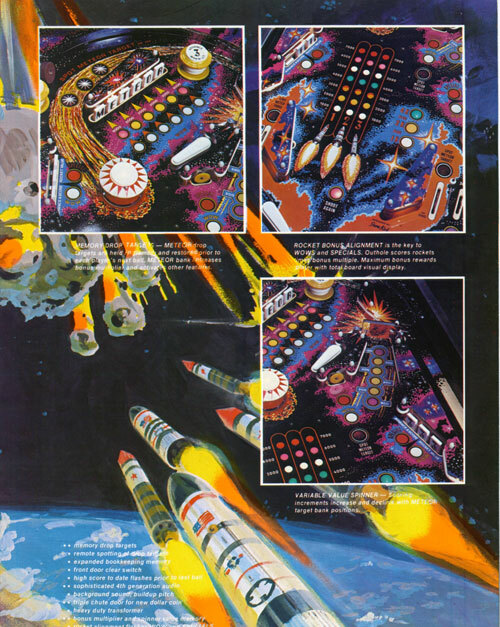 As I've said before, my family never had an Atari game system, so I never paid much attention to game releases... but I sure would have gotten this! Did any of you luckier Star Kids have this? 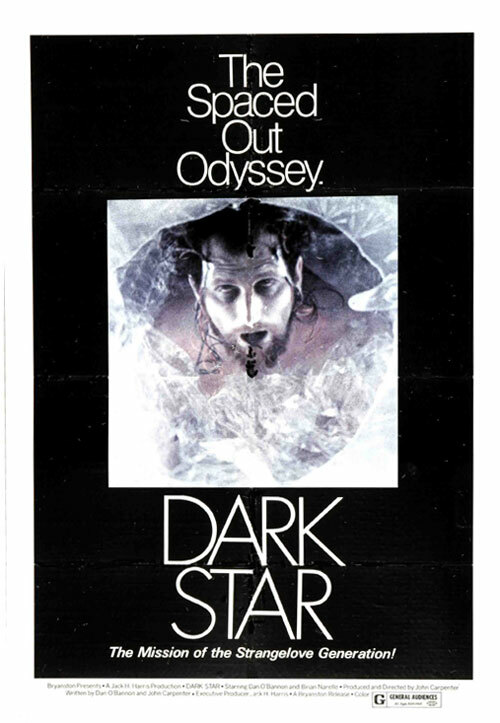 A selection of theatrical one-sheets for the 1974 John Carpenter/Dan O'Bannon sci-fi satire, Dark Star. 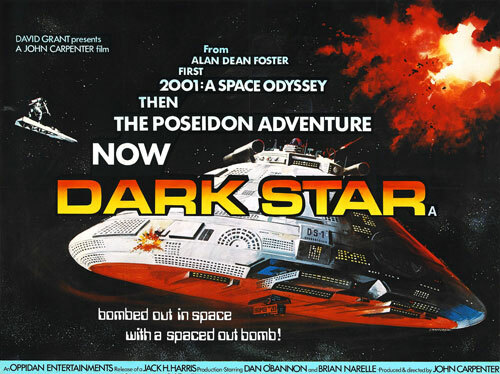 Funny how the top poster name-checks SF author Alan Dean Foster, because as far as I know, his only involvement with Dark Star was penning the paperback novelization (which I know I have somewhere around here, but I can't seem to find, dammit). R.I.P. 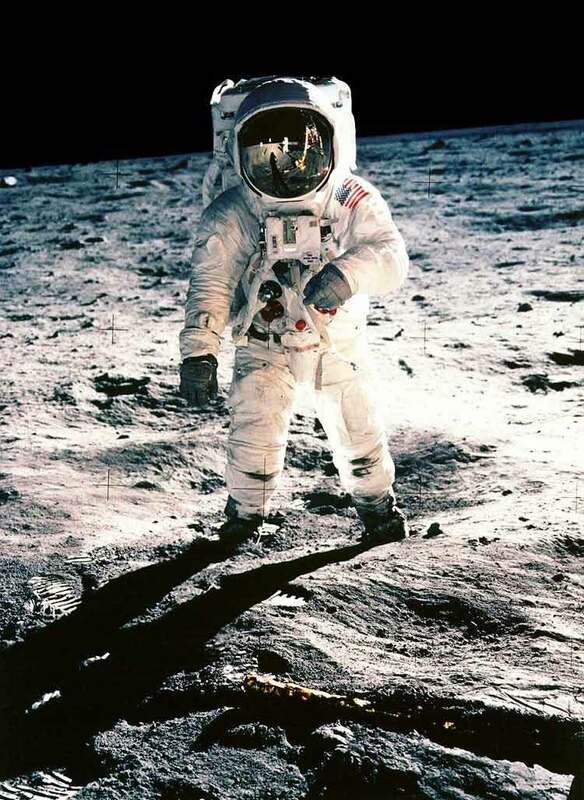 Neil Armstrong. "We Come In Peace For All Mankind." 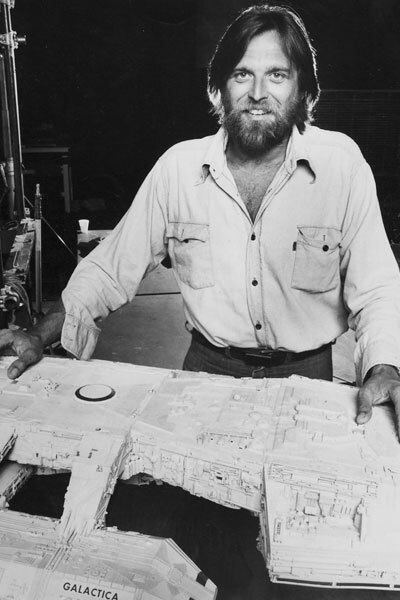 Special effects maestro and co-producer John Dykstra poses with the original shooting model of the titular Battlestar Galactica warship during production of the pilot film. 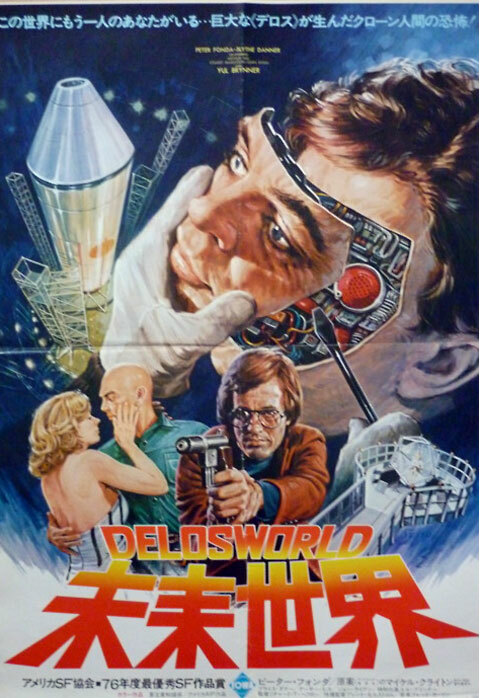 "Saga Of A Star World," back in early '78. 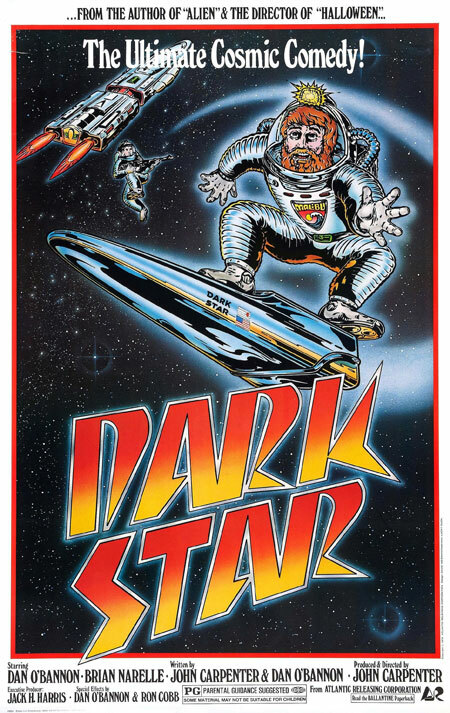 VCI Entertainment has announced that the 1974 Dan O'Bannon/John Carpenter sci-fi satire, Dark Star, will be receiving a high-definition Blu-ray release on October 2. The VCI website gives few details, but presumably, this will contain all the features of the previous DVD edition released by VCI, along with a new, high-definition transfer (and much more attractive packaging). In the mid twenty-first century, mankind has reached a point in its technological advances to enable colonization of the far reaches of the universe. DARK STAR is a futuristic scout ship traveling far in advance of colony ships. Armed with Exponential Thermostellar Bombs, it prowls the darkest reaches of space on a mission to seek out and destroy unstable planets ahead of the colonist. But there is one obstacle that its crew members did not count on -- one of the ship's thinking and talking bombs is lodged in the bay, threatening to destroy the entire ship and crew! 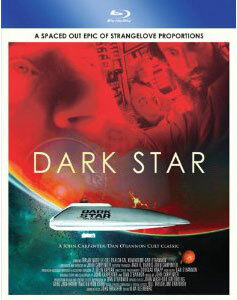 DARK STAR was originally intended to be a 68 minute film. 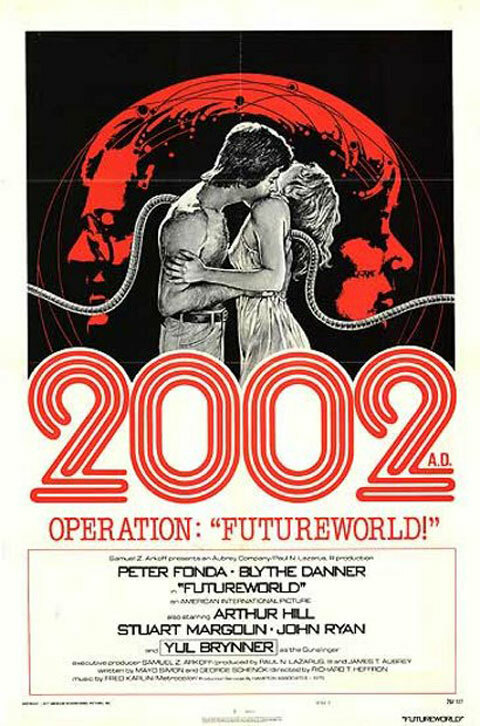 Jack Harris, the Hollywood producer, convinced the filmmakers to shoot 15 minutes of extra footage and he released the expanded version theatrically in 1975 through Bryanston Pictures. The suggested retail price is a very reasonable $19.95; Amazon already has it listed for pre-order at a discounted price of $14.99. • Coming Attractions: I've been plugging away on a few more substantial posts for this site, and with luck, they'll start showing up here over the next few weeks. Specifically, a review of the British/German series Star Maidens, a new "Fave Five," my long-promised review of Strange New World, and equally long-promised article about the aborted Star Trek II (a/k/a "Phase II") television series. There will probably be a new poll in September, and I've got another "Favorite Episode" piece nearly done. Fingers crossed (though it makes it harder to type). • A Few Words About Comments: This may sound cranky or curmudgeonly, but as I close in on my half-century mark, I think I'm entitled to a bit of, uh, curmudgeoness. Anyway, I'm trying to be more selective about which comments I approve for publication on this blog. Over the last two and a half years, the reader comments posted to this blog have overwhelmingly been in line with my intentions for the site: enthusiastic, celebratory, nostalgic and, generally, upbeat. We've also remained virtually troll-free. But recently, I'm finding myself slightly less happy with the "interactive" aspect of this blog. Perhaps it's inevitable that as readership grows, I'm going to see more comments show up in my e-mail box for moderation that I'm uncomfortable with or that, frankly, just irritate me. I'm even thinking about disallowing "Anonymous" posting entirely, as most (though not all) of the comments that bug me are posted without a name attached. I haven't taken that step yet, but I'm considering it. • People selling something. That's not what this site is about. Try ebay. Related: people trying to find out what their memorabilia is worth. Again, that's not what this site is about. There are hundreds of other places online that are more appropriate for that kind of question. Use Google. That's what it's for. • Linking to illegal downloads/bootleg merchandise. I've actually addressed this before. Comments that link to torrent sites or unauthorized video dealers will not be approved. No moral judgement here; I just don't want to have this site hosting those sort of links. • Non sequiturs. Okay, this is the one that's really driving me nuts lately. I've been seeing a lot of comments recently that I simply cannot make any sense of whatsoever. I understand that this site can be accessed all over the world, and English isn't everyone's first language - but I can usually tell when that is the problem. Far more often, I get comments that simply repeat the information I wrote about in the post (as if the commenter only looked at the headline and/or illustration before clicking the comment tab, feeling compelled to show off his knowledge of the subject) or utterly nonsensical comments that, well, indicate serious weaknesses in reading comprehension. If you're going to take the time and make the effort to comment on something I've posted here, please think about it a bit, and make it worthwhile. • Negativity. You know, I understand that not everyone likes the movies and television shows and other stuff I write about on this blog; some people outright hate them. Others think they're "cheesy" (a word that really bugs me and automatically raises my defensive shields), "lame," or just trash. And yes, everyone is entitled to their own opinion. But this blog isn't the place to tell the world how crappy you think The Starlost is, or for expressing your ironic sense of post-modern snark. In the header at the top of this page, I use the word "celebrate," and that's what this blog is about. 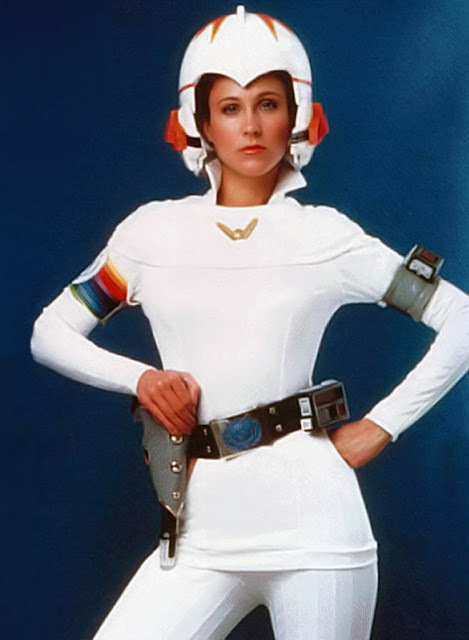 If you think the original Battlestar Galactica is lame, or that Starcrash is the Worst Movie Ever, write about it on your own site, or go find an appropriate message board somewhere. This is a blog, and, more to the point, it's my blog, and I'm not going to stand for people coming in and being jerks in my house. Please do keep sharing your own Star Kid memories in the comments, or passing on cool behind-the-scenes information, and politely correcting factual errors I make. And please, have fun with (and make fun of) these shows and movies. Just try and keep it... affectionate. That's the word I'm looking for, I guess. ADDENDUM: I'm also not saying that people can't disagree with my opinions. That's cool. Just be polite about it, okay? • Blatant Cross-Promotion: As usual, here's my standard pitch: anyone who enjoys my writing and reviews on this blog should check out my DVD Late Show site, where I have been reviewing B-movies, cult films and genre television shows on DVD and Blu-ray disc since 2005. 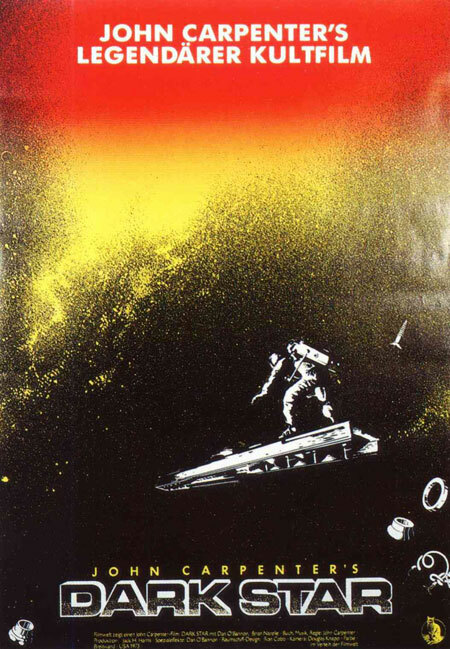 Among the over 700 reviews are plenty of Space: 1970-era favorites, like Battle Beyond The Stars, Damnation Alley, Starcrash, The Starlost, the Space: 1999 Blu-rays, and many more. Universal Home Entertainment has just announced that they will be re-releasing the second year of Buck Rogers In The 25th Century as a single-season DVD set in November. As with the re-issue of Season 1 back in January, these appear to be identical to the discs released in The Complete Epic Series set back in 2004 - only rather more expensive. 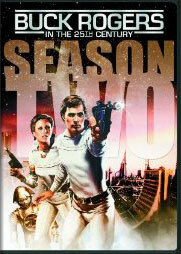 Buck Rogers In The 25th Century: Season Two will contain all 11 episodes (13 hours) on four discs, presented in full screen video, English mono sound, and with subtitles in English, French and Spanish - at a suggested retail price of $24.98. How gorgeous is this? Feast your Star Kid eyes on this beautiful cover painting by the extraordinary George Wilson for Gold Key Comics' Flash Gordon #20, published in late 1978. 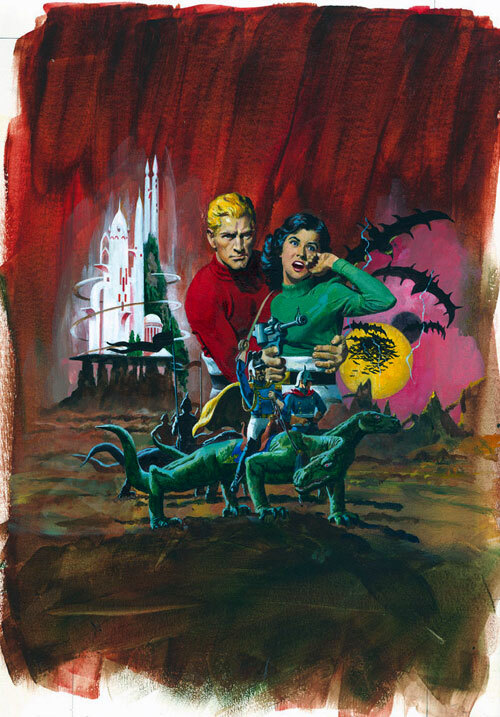 Wilson painted hundreds of comic book and paperback covers (including the Avon Flash Gordon novels I wrote about a week or so ago). 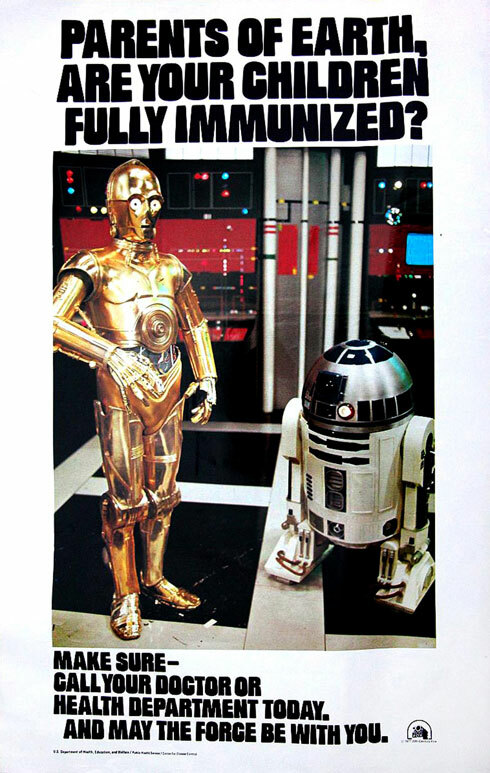 I actually had this issue - by 1978 I was picking up any space-themed comics I could find. I really love this kind of illustration, and really miss it in modern publishing. 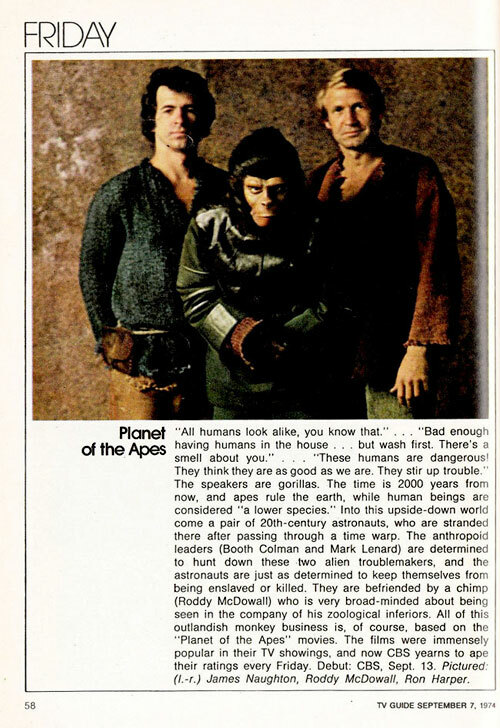 From the September 7, 1974 "Fall Preview" issue of TV Guide magazine, here's the write-up for the weekly CBS television series, Planet Of The Apes. As usual with these previews, the editorial tone is smug and condescending, but as all genre programs of the time were basically considered to be "kid's shows," it's not too surprising. Still, I am definitely a fan of the TV series. I basically just consider it to be another alternate Apes timeline, and go along for the ride, talking humans and all. 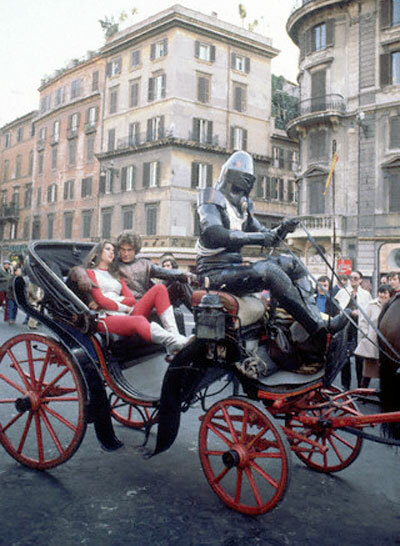 I also very much like the leads - Roddy McDowell, of course, but also Ron Harper and James Naughton. Even watching the show as an adult, I find the characters they portrayed to be quite admirable - brave, loyal, and intelligent - and the chemistry between the actors was strong. 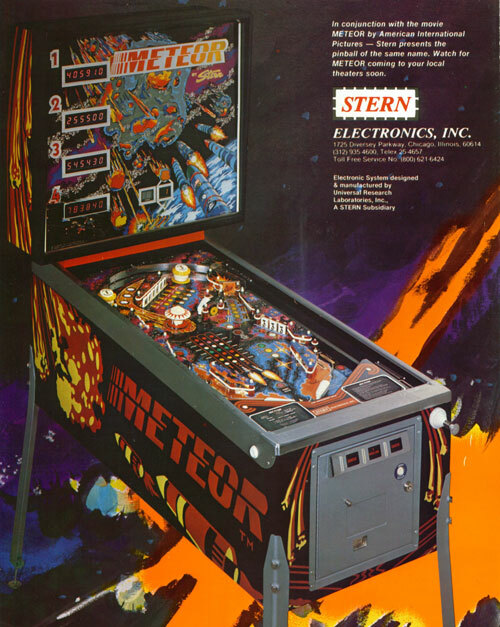 As I've mentioned before, the 1979 sci-fi disaster flick Meteor had a surprising amount of merchandising, from the expected tie-in novelization, comics & Warren magazine to View-Master reels... and this arcade pinball machine from Stern. 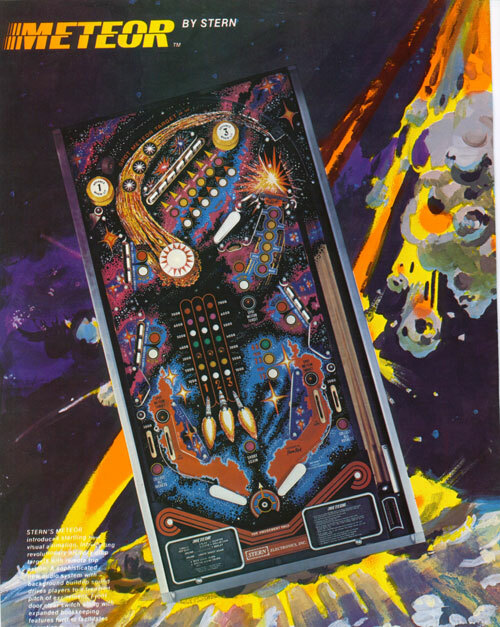 I don't believe I ever saw this in person, but the flyer makes it look like it might have been a fun machine to drop a few quarters on. Here's another genuine rarity from that video treasure trove known as YouTube: a 30-second TV spot promoting the theatrical release (NOT the television premiere) of the original Buck Rogers In The 25th Century pilot movie in the Summer of '79. As I've recounted before, I saw this in the theaters accompanied by my mother and sister... needless to say, I'm the only one of us that actually remembers it. One show that I originally intended to write about here at Space: 1970 a lot more than I have (especially, as I haven't written about it yet, really) is the 1974-76 Saturday morning children's adventure series, Land Of The Lost. 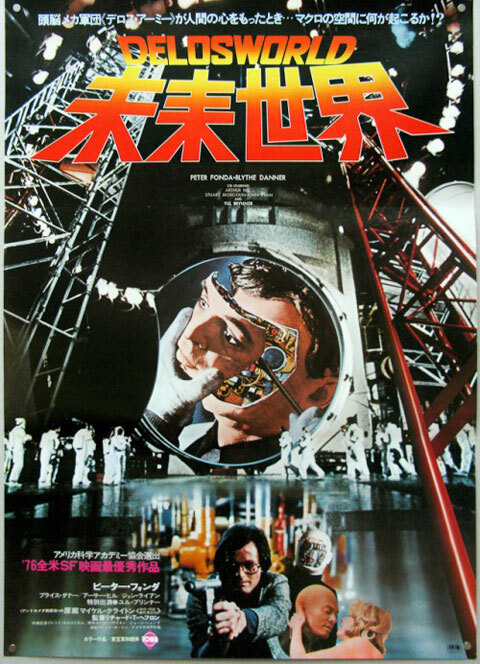 During its three-season run, it was probably the most imaginative sci-fi show on television, and certainly the one with the most special effects per episode. I really need to start giving this show some of the attention that it deserves. This cast shot certainly demonstrates just how extensively the show relied on chroma-key/bluescreen compositing. 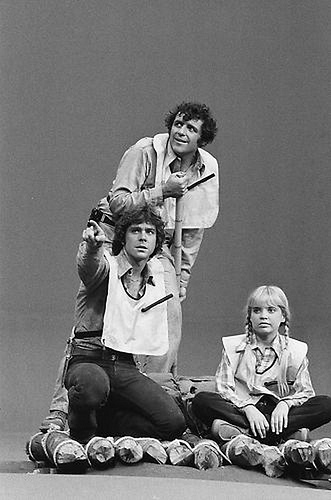 Series stars Spencer Milligan (as Rick Marshall), Wesley Eure (as Will Marshall) and Kathy Coleman (as Holly Marshall) pretend to navigate their raft down a river - a miniature river and landscape that would be shot seperately and matted in behind them for airing. Maybe it doesn't have a cool jingle like the Cylon Bubble Machine, but I really wish I had had one of these. 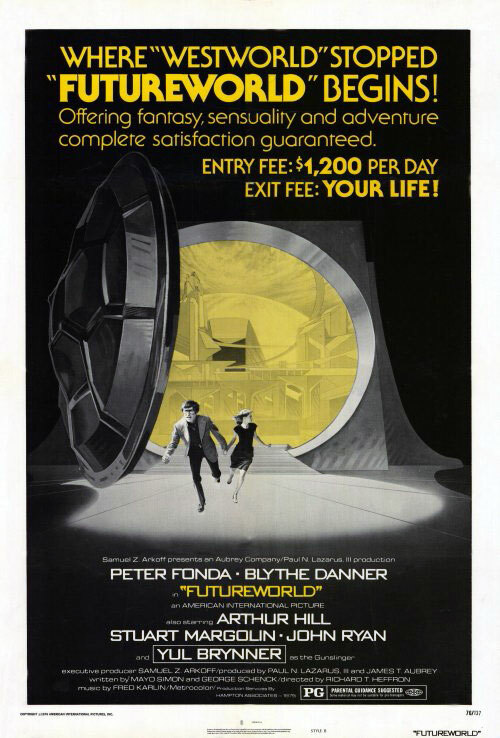 Futureworld, American-International Pictures' 1976 sequel to MGM's Westworld may not have been as good as its precursor, nor as memorable, but it did have some striking advertising art. 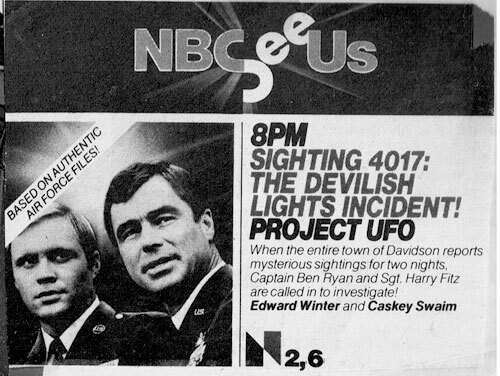 It's not easy finding much memorabilia for the Jack Webb-produced, NBC television series, Project U.F.O. online - so here, scanned from my own scrapbook, is a vintage TV Guide advertisement for the October 28th, 1978 episode. According to the IMDb, alongside series regulars Edward Winter and Caskey Swaim, this episode guest starred Jared Martin, late of The Fantastic Journey. I wonder who currently owns the rights to this series? It's one of the few genre shows of the decade still not available on home video - and unlike most of them, this one was actually successful enough to last two (albeit 13-episode) seasons! 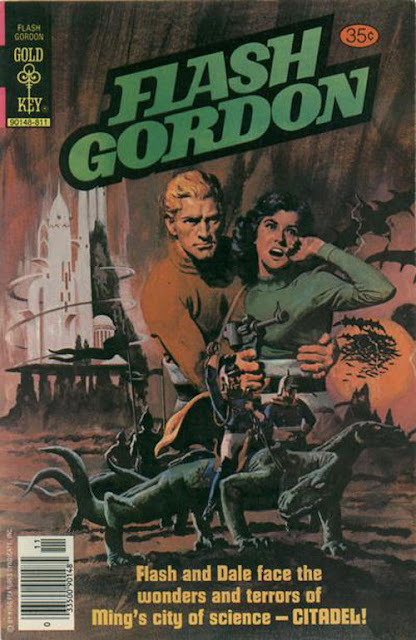 In 1974, Avon Books published a half-dozen Flash Gordon novels by "Con Steffanson," a pseudonym of noted science fiction author Ron Goulart. This was part of a publishing program that also included paperback adventure novels chronicling the exploits of King Features' other comic strip heroes, The Phantom and Mandrake The Magician, playing into the wave of nostalgia for Thirties & Forties pop culture that was around at the time. 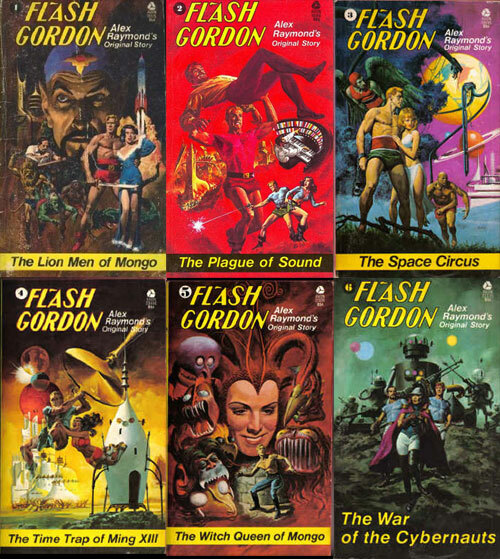 Unlike the David Hagberg Flash Gordon novels that Tempo Books would publish about a half-decade later, these six volumes followed the continuity and characterizations of the original comic strips fairly closely, with half of the books set on Mongo. The other three, on the other hand, harkened more to the 50s and 60s version of the newspaper strip, with Flash, Dale & Zarkov scooting around to other planets, fighting villains other than Ming and his minions. They're fairly fast reading - obviously aimed at teens - and while they have their moments of Goulart's trademark odd humor, they're also crackin' good space adventure yarns. I didn't have these books when I was a kid, either*. 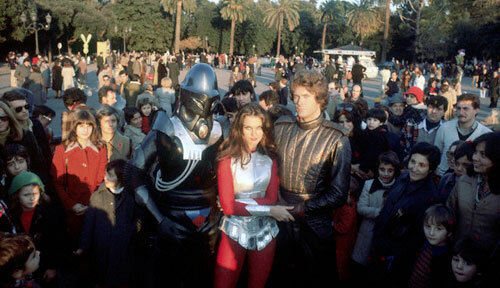 At ten years-old, I wouldn't have had any idea who Flash Gordon was. If they had seen print just a few years later, around the time of the Filmation cartoon or the Mike Hodges' feature, I'm sure I would have been a lot more interested, especially with those gorgeous cover paintings by veteran paperback and Gold Key Comics artist George Wilson (which explains why it looks a lot like Magnus, Robot Fighter is on cover #2, I guess). 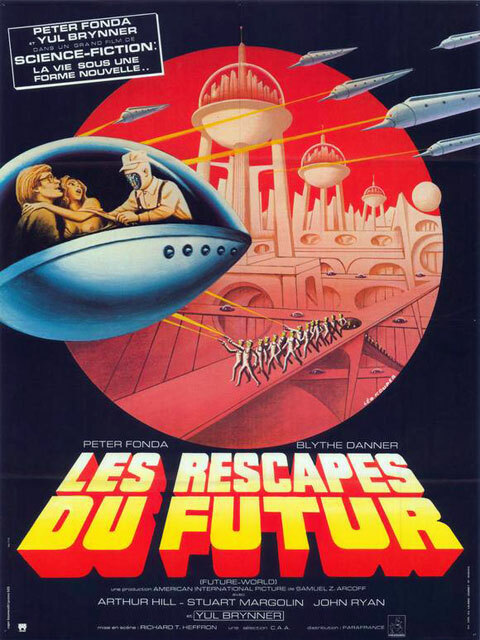 They may not have been on my radar in '74, but their existence does show that even in the years just before the success of Star Wars made Flash (and his comic strip cohort, Buck Rogers) hot cinematic properties again, the iconic interplanetary hero was still a part of the Seventies sci-fi spacescape. 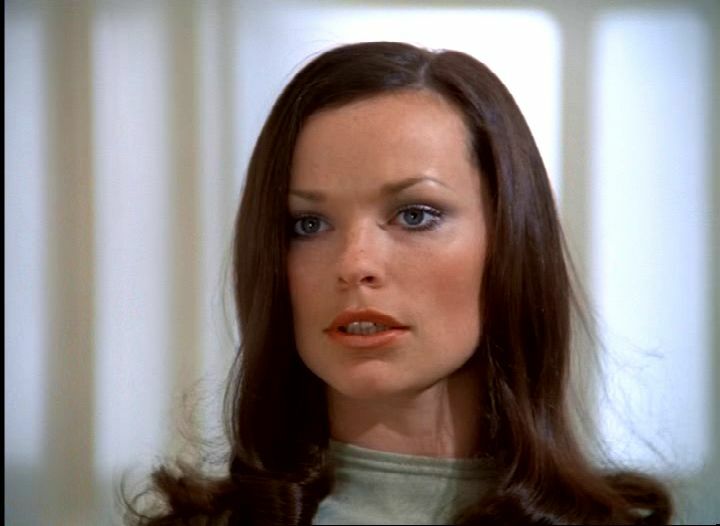 Beautiful brunette Lea Brodie as Delphine, in the John Dark/Kevin Connor production of Warlords Of Atlantis (1977). 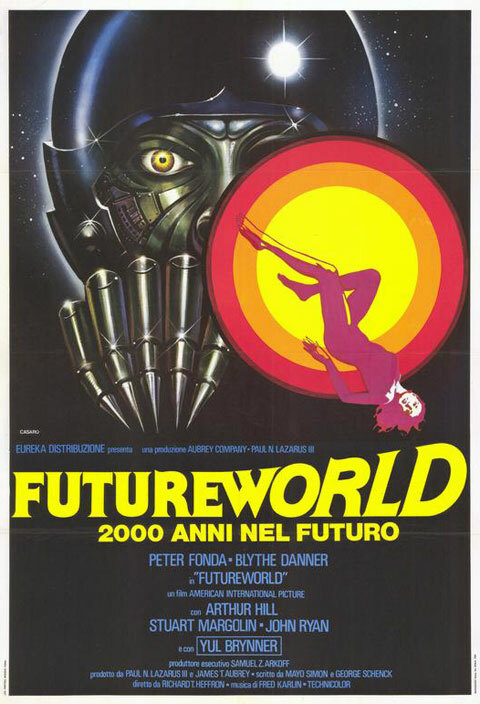 This month's Space Babe comes from inner space in the fine form of an Atlantean slave girl who comes to the aid of stranded 19th Century mariners led by stalwart Doug McClure (The Land That Time Forgot, At The Earth's Core) in this fun, Saturday matinee lost world adventure. 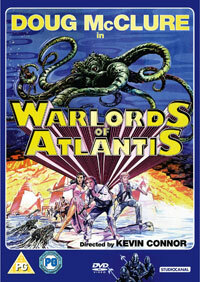 I admit it - Lea was not my original choice for August, but I just received and watched my new imported-from-the-UK Warlords Of Atlantis DVD and was struck by the beauty of the young actress, whom I immediately recognized from her role in the Roger Moore film, ffolkes. And since this is my blog, she gets this month's nod for Space Babe! The lovely Lea (also known as Lea Dregorn) had a very brief acting career in the Seventies, appearing on British television programs (including a first year episode of Space: 1999, "Force of Life"), stage, and in a handful of feature films. She retired from acting in the 80s, and is now a spiritual and holistic healer. 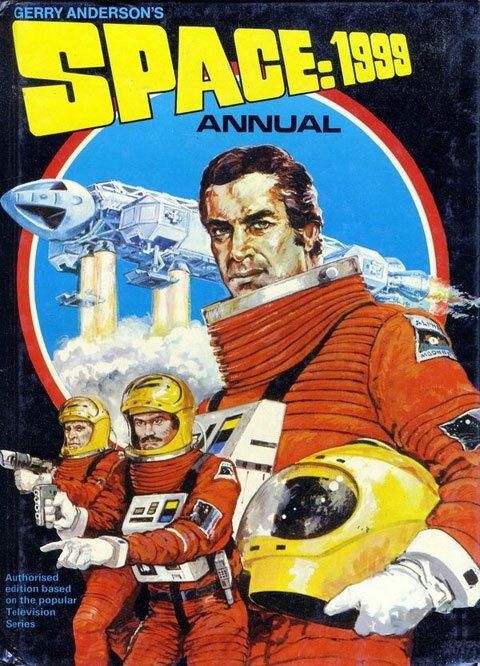 Here are five (I'm not sure how many there were, in all, though I'm sure one of our UK Star Kids could tell me) British childrens' Annuals for Gerry Anderson's Space: 1999. Growing up in the United States, I never saw any of these hardcover publications until I was in my twenties and going to comics and science fiction conventions, so I have a bit of a fascination with them. 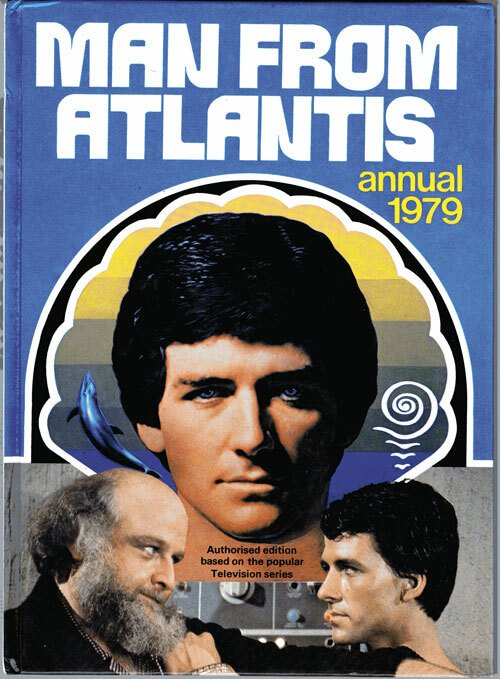 It seems like almost every genre show, no matter how short-lived, had at least one tie-in Annual published, including Man From Atlantis, Logan's Run and Star Maidens! 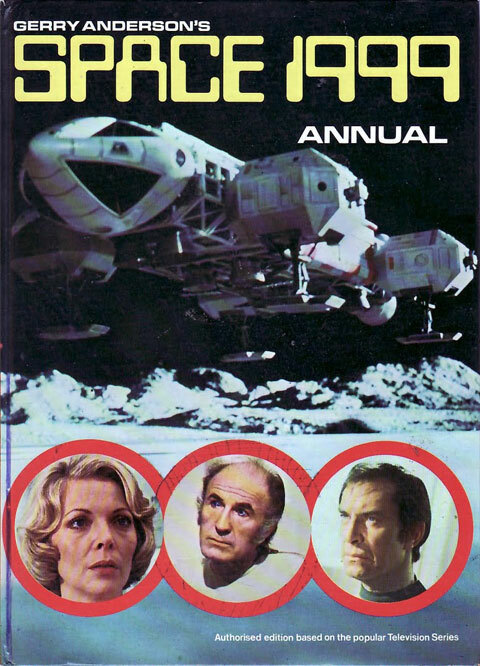 UPDATED: A loyal Space: 1970 fan over on Facebook kindly provided the fifth cover above. It actually may be my favorite. I kinda like those Year Two monsters... I just wish we hadn't seen them re-used on the show so damned much! 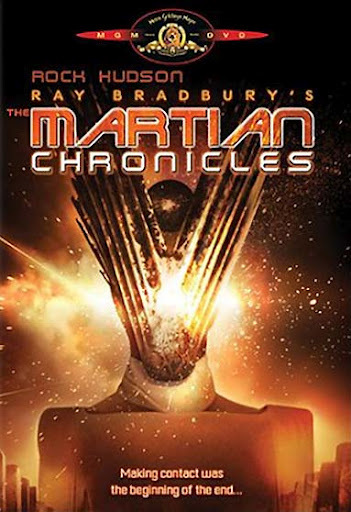 You know, if I had more on the ball, I would have recognized today's Mars Curiosity Rover landing with a full review of the 1980 television miniseries, The Martian Chronicles, based on the book by Ray Bradbury, with a screenplay by Richard Matheson, directed by Logan's Run's Michael Anderson. But I was, frankly, clueless as usual. 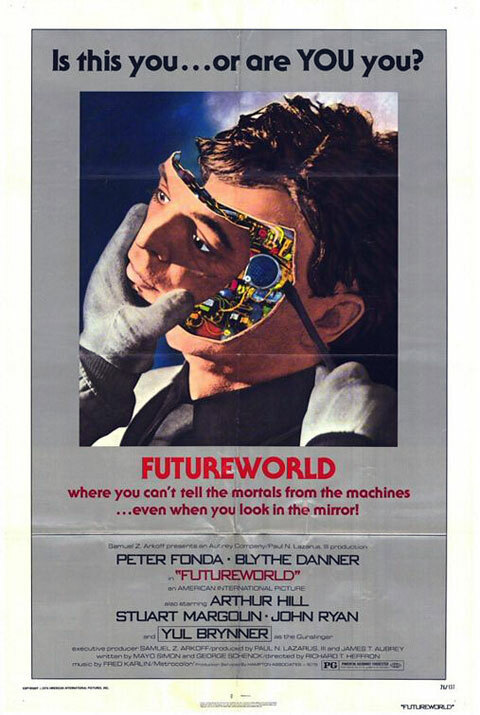 Instead - here are links to the two previous posts I've done on the telefilm (which I actually like a great deal, by the way), and will try to to re-watch the DVD (pictured above) and get a review posted here soon. 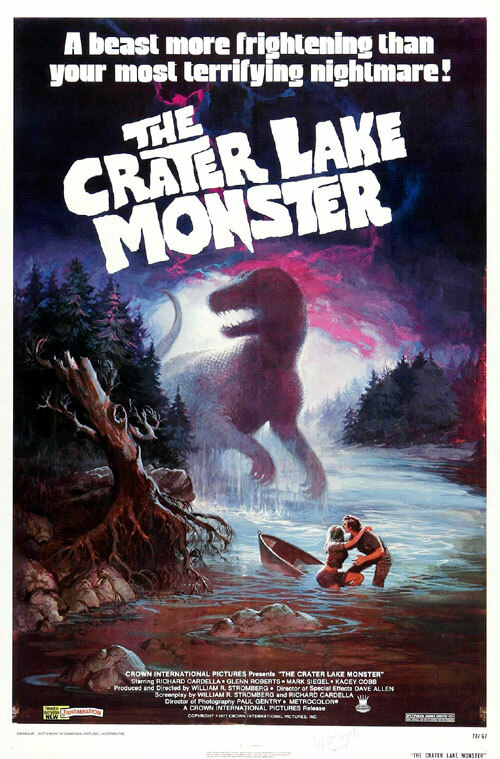 Pretty much the only good thing about Crown International Pictures' 1977 drive-in fodder, The Crater Lake Monster, is the evocative theatrical one-sheet pictured here. (I'm sure someone out there knows who the artist is.) Unfortunately, the movie itself is an ultra-cheapo bore with a no-star cast that only sparks to life during the all-too-brief instances where the titular monster is on screen. Of course, the film's creature looks nothing like the Tyrannosaur-like beastie on the poster, instead resembling some sort of mutant plesiosaur/salamander hybrid. To be fair, the stop-motion animation in the movie, executed by David Allen, is actually pretty good - there's just not enough of it. Surprisingly, The Crater Lake Monster is actually available on Blu-ray disc, paired up with Crown International's space spoof Galaxina. And... yeah, I own it. 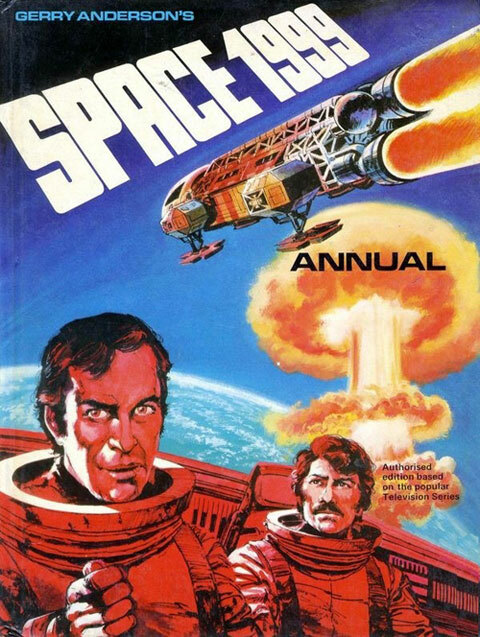 • July was the biggest month ever here at Space: 1970, both in number of items posted and in traffic/pageviews. Somehow, after the relative blogging drought earlier this year, I managed to somehow come up with 49 posts in July - a personal best. Don't expect me to keep it up, though; I've got a big writing project on my desk this month (my first pulp novel) that will undoubtedly cut into my blogging activities. Still, I'll do my best not to neglect this site too much. I also want to thank every person who has used the Amazon links on this site to make purchases of vintage sci-fi on DVD/Blu-ray. Getting that little kickback from Amazon every month helps me rationalize all the time and effort I put into this otherwise non-paying endeavor. It really helps and is greatly appreciated. • Speaking of DVD reviews, I finally got my Invisible Man review up a few days ago. I'm about halfway through the Star Maidens DVDs that I ordered from England, so I should get a review of that series posted sometime this month. It's an "interesting" show, and I'm glad I picked it up. 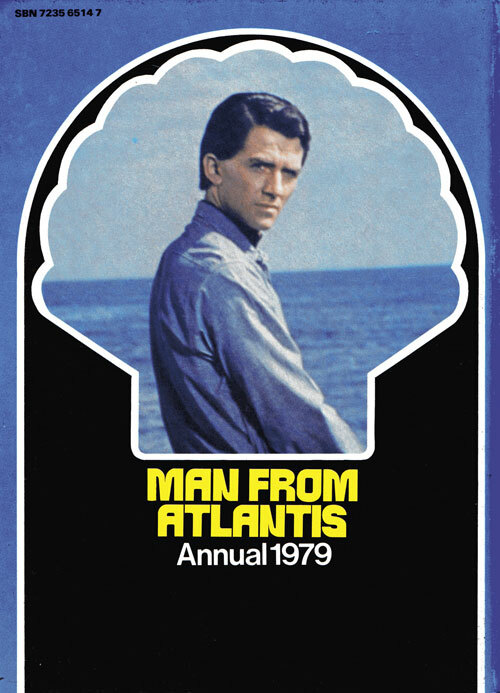 • Finally, the usual Blatant Cross-Promotion: Anyone who enjoys my writing and reviews on this blog should check out my DVD Late Show site, where I have been reviewing B-movies, cult films and genre television shows on DVD and Blu-ray disc since 2005. 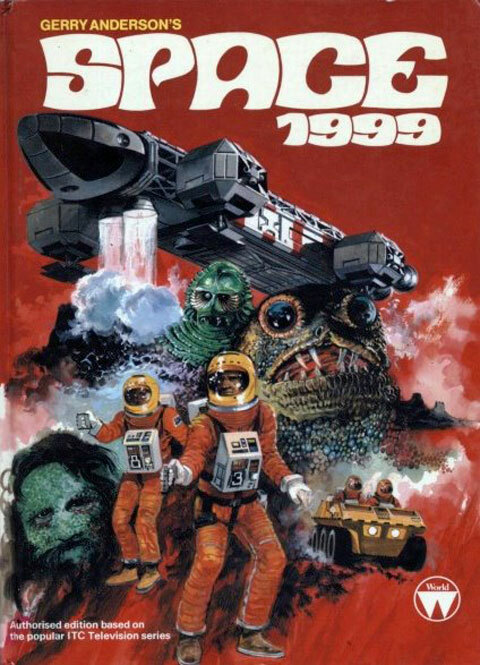 Among the over 700 reviews are plenty of Space: 1970-era favorites, like Battle Beyond The Stars, Damnation Alley, Starcrash, The Starlost, the Space: 1999 Blu-rays, and many more.